The Rt. Hon. Patricia Scotland QC presents the 2018 Biennial Report of the Commonwealth Secretary-General to Prime Minister the Hon. Dr. Timothy Harris. 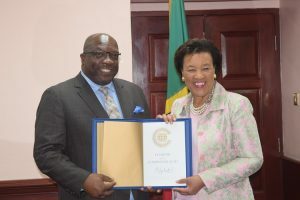 BASSETERRE, St. Kitts – St. Kitts and Nevis’ Prime Minister the Dr. Honourable Timothy Harris met with the Commonwealth Secretary-General the Rt. Hon. Patricia Scotland QC today at Government Headquarters, joined by their shared values and concern for small island developing states (SIDS). Scotland, who was born in Dominica, began her Caribbean tour Monday ahead of the 2018 Atlantic hurricane season, which runs June 1-November 30. 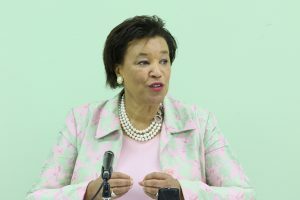 She explained that one of the initiatives on this front is the Blue Charter of Principles for Sustainable Ocean Development, which the 53 Commonwealth nations adopted at last month’s CHOGM. This charter will help countries develop an integrated approach in building the “Blue Economy,” one that supports artisanal fishing and the contributions of young people and women. The World Bank defines the Blue Economy as the sustainable use of ocean resources for economic growth, improved livelihoods and jobs, and ocean ecosystem health. The Blue Economy encompasses climate change, fisheries, maritime transport, renewable energy, tourism and waste management. During her visit to St. Kitts and Nevis, the Commonwealth secretary-general also held separate meetings with Cabinet members, including Minister of Tourism, International Trade, Industry and Commerce the Hon. Lindsay Grant and the Minister of Agriculture, Lands and Cooperatives et al. the Hon. Eugene Hamilton. Discussions touched on the Blue Charter, as well as a host of matters related to climate resilience, mitigation and adaptation planning. Last September, Harris and his Cabinet met for a post-Hurricane Maria session. There, they began the process of critically evaluating disaster mitigation and preparedness with a view to upgrading present protocols. One of the considerations raised was the need for general improvements in current building codes in order to improve the resilience of commercial and residential properties.